How many of you have rules for grocery shopping? I’m guessing most of you raised your hand. I’ve been there. I could list a million rules I’ve heard, I’ve used, I’ve imagined… and they’re all bullsh!t. But I’m here to tell you to throw your rules out the window in lieu of the following. I double dog dare you. (Now you have to, sorry, no excuses). That’s right. Don’t like peas? DON’T BUY THEM. Hate olives? You don’t have to eat them. Despise kale? YA’ DON’T NEED IT. Squirm at the idea of eating another rice cake? Put a fork in ‘em they’re done for. Seriously. Fill your grocery list and grocery cart with foods you like to eat. Eating should be pleasurable as much and as often as possible. I’m all for a good deal, but food waste is the literal worst (well, at least worse than nails screeching on a chalk board, but definitely not as bad as burning the roof of your mouth because you just can’t wait for your food to cool). If something is canned or frozen and I have the storage and budget for it, while also knowing I can work it into future meals, sure, get it. If it’s something you can substitute out for another item on your list-that works too. But if your buying it for the sake of the sale and there’s a chance it will go bad, well that’s just throwing away money and perfectly good food (at least at the time of purchase). Nah, skip that. Taste is one of our FIVE senses. It’s a major way we perceive and experience the world and life. So you should absolutely, positively allow room for exploration with your taste buds. If you hate something you can spit it out. Just do so in a polite and discrete manner, pretty please. Maybe it’s pretzels and peanut butter. Maybe it's pears and peanut butter. Maybe it’s Oreos and peanut butter. Maybe it’s veggies and peanut butter. Maybe it’s a peanut butter chocolate chip larabar. (I really love peanut butter and have it at least daily) But there are non-peanut butter snacks for those who cannot have peanut butter (I assume the only reason you wouldn’t have peanut butter is because you couldn’t have peanut butter) Like Yogurt and granola and fruit (with or without peanut butter…) Other nuts and seeds. Ice cream. Sorbet. Chips and dip. Bars that don’t include peanuts or peanut butter. Smoothies. Half a sandwich. CHOCOLATE. A whole sandwich. Literally anything can be a snack if you believe in it enough (and it satiates your hunger during non-meal times). Yeah I know I just wrote a whole blog post laying out my rules but in reality, there are no rules. I strongly encourage you to incorporate the above four guidelines as much as possible but you can do whatever you so please with your personal grocery list, grocery shopping experience and what you cook for you and your family. Do you have food rules you still follow? Are you ready to start breaking them? I’d love to hear from you on your experience below! 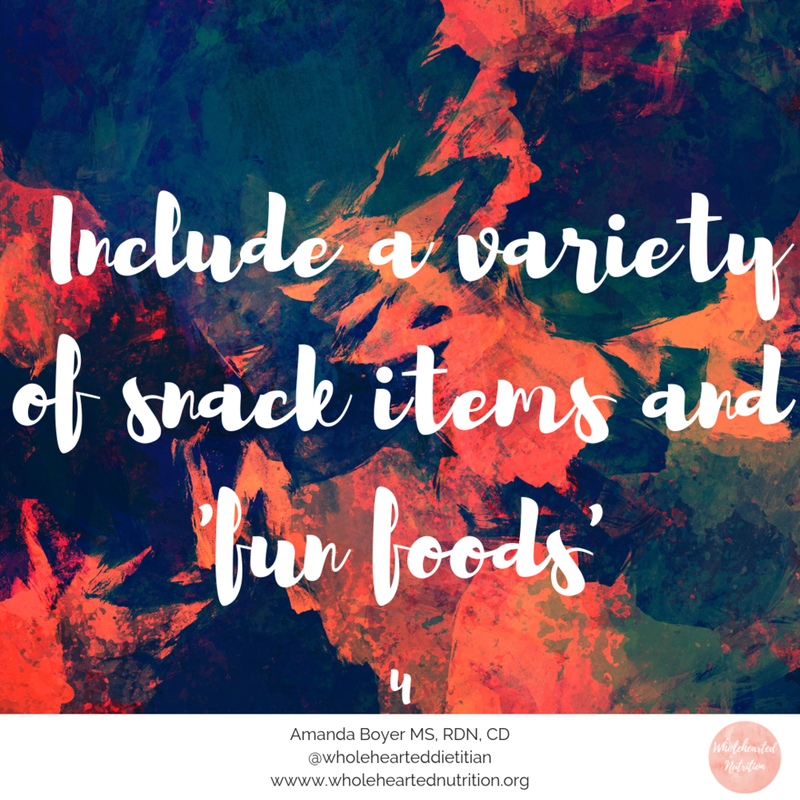 Amanda is an anti-diet dietitian and nutrition therapist practicing in Bloomington, IN and virtually. If you are looking to work with a dietitian, she is currently accepting new clients. Check out her services or reach out to set your FREE discovery call today. She would love the opportunity to work with you! Newer PostYou Can Eat. Period.